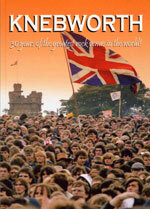 Knebworth Concert book: 30 Years of the Greatest Rock Venue in the World! Rock Venue in the World! This full-colour, 48-page hardback scrapbook, published in 2003, illustrates the history of the Knebworth concerts from their beginnings in 1974... through Pink Floyd in 1975, The Rolling Stones in 1976, Genesis and Frank Zappa in 1978, Led Zeppelin in 1979, The Beach Boys in 1980, Deep Purple in 1985, Queen in 1986, Paul McCartney & Eric Clapton & Elton John & Mark Knopfler & Jimmy Page & Robert Plant & Phil Collins & everyone else in 1990, Oasis in 1996... to the biggest music event in British history, Robbie Williams at Knebworth in the summer of 2003. Packed with rare unseen photos from the Knebworth Archive, it's a fascinating and humourous look back at the madness and the mayhem, the magic and the music... of the greatest rock venue in the world!